Acoustic barrier for Acustimodul 80 panels and RS7C door. 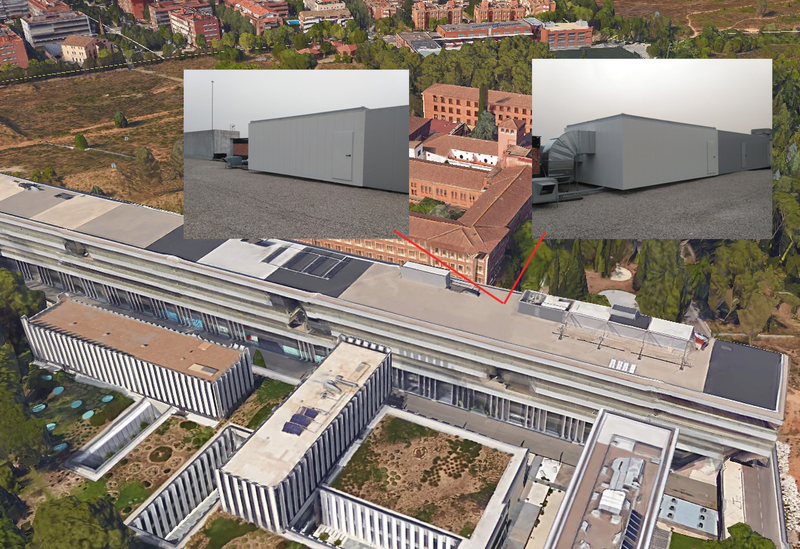 This project concerns the air-conditioning installations located on the roof of a building. 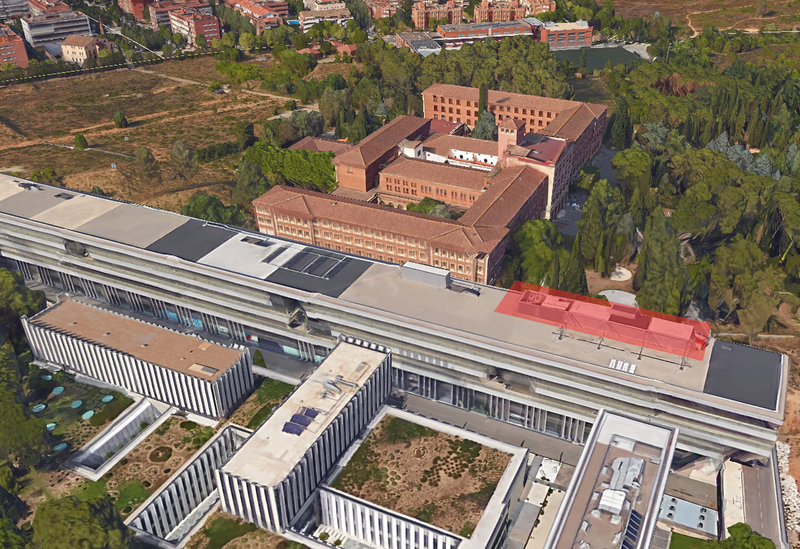 Before performing our treatment, the roof already had previous installations which had been acoustically treated with barriers. For the new machines, which are going to be added to the already existing ones, a treatment with similar characteristics to the existing one has been projected, although with the materials manufactured by Acústica Integral. The new acoustic barrier was built with Acustimodul 80 type modular acoustic panels by Acústica Integral. This type of panel has been specifically designed to build acoustic barriers and enclosures. Its size and weight make it ideal for its easy handling and assembly, as well as its insulating and absorbent characteristics which make it suitable for the treatment of industrial machinery. The access to the inside of the shielding is made with acoustic door model RS7C, which enables maintaining the acoustic insulation of the panel without losses. 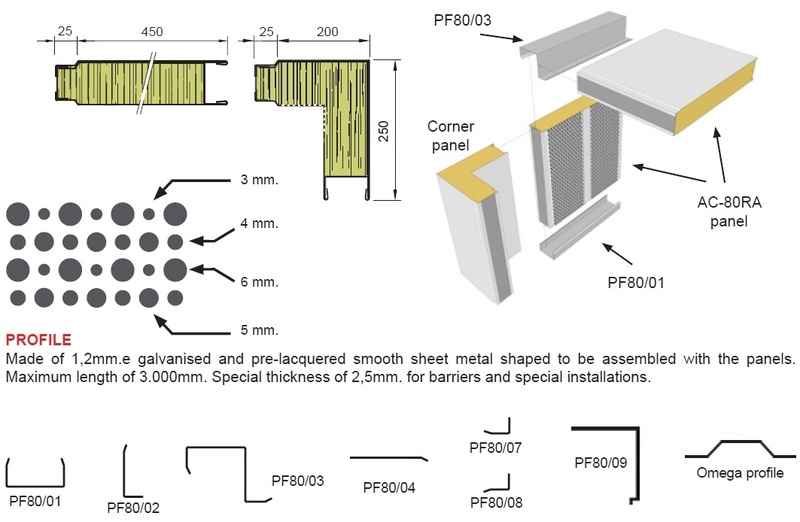 Made of galvanised and pre-lacquered smooth metal sheet of 1.2 mm thickness, designed to be assembled with the panels and with maximum length of 3,000 mm. Special thickness of 2.5 mm for special barriers and installations. Exterior: Pre-lacquered smooth sheet of 1 mm thickness. Interior: Pre-lacquered multi-perforated sheet 0.5 mm thickness. Colour: Light grey similar RAL 9002. Other RAL colours upon request. Absorbent material: Rock wool of 70 Kg/m³. Dimensions: 450 x 2000, 2500, 3000 or 4000 mm. Thickness: 80 mm. Weight: 21 Kg/m². Percentage of perforated surface: 28 %. Maximum admissible tension: σ = 224 N/mm². Young Module: E = 210.000 N/mm². Reaction to fire: B s1 d0 according to AITEX Nº 14AN1833. Acoustic insulation: APPLUS File Nº 12/4570-709. Acoustic absorption: APPLUS File Nº 12/4570-708. Project: Acoustic barriers for air-conditioning equipment. RS7C Acoustic door for access.